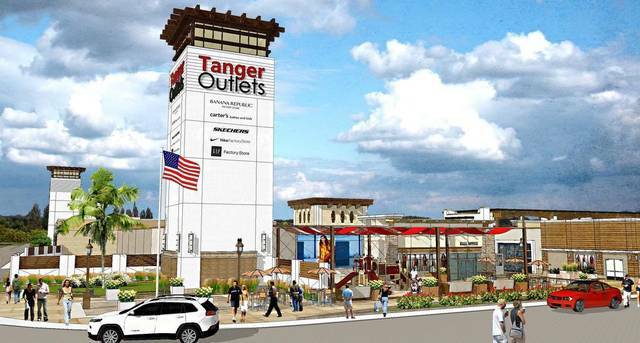 Tanger Factory Outlet Centers says it has signed up several retailers for its proposed shopping center near the Texas Motor Speedway as the race to build an outlet mall heats up in far north Fort Worth. Nike, Levi’s, Banana Republic, Gap, Old Navy, Express, Skechers, Carter’s and Oshkosh have signed leases for the planned 350,000-square-foot center, the company said today. It’s currently negotiating with numerous other leading designer/retailers and will begin construction on Tanger Outlets Fort Worth once it has leased out 60 percent of the space, said Steven Tanger, the company’s president and chief executive officer. The project update from Tanger, based in Greensboro, N.C., comes as the Fort Worth City Council is considering a request for incentives for a different outlet center proposed several miles south on I-35, near Cabela’s. That project, to be called The Outlets at Alliance, is being proposed by Woodmont Land Co.
At a Fort Worth City Council meeting last week, city officials said that project would be about 580,000 square feet with potential tenants including H&M, Vera Bradley, Brooks Brothers, J. Crew, Abercrombie & Fitch, Guess and Famous Footwear. The developer has not yet announced any signed leases for the project. The city has offered Woodmont a 15-year grant of 85 percent of the city’s 1-cent sales tax if the project reaches $100 million in investment. The incentive is capped at $20 million. Tanger said that based on his company’s 35 years of experience in the industry, there is not room in the north Fort Worth market for two outlet centers. Tanger Outlets Fort Worth is being built as part of Champions Circle, a 279-acre commercial mixed-use development at the southwest corner of I-35 and Texas 114. A Buc-ee’s Travel Center is under construction at the site, directly across from the speedway. The project is being built by Fine Line Diversified Development, which is controlled by Fort Worth developer and financier Ed Bass. Tanger estimated that the cost of the Fort Worth outlet center will be between $80 million and $100 million. He said it usually takes about a year for a new center to open once construction begins. In May 2015, the Fort Worth City Council approved an incentive for the Tanger Outlets project if developers invest at least $70 million. The incentive is a grant of 85 percent of the city’s 1-cent sales tax for 10 years. The incentive is capped at $25 million.